With no shame, I fully admit that I'm one of those people that jumps on the pumpkin bandwagon as soon as that first leaf falls off the tree. It's not just the cookies, pies, muffins and loaves that I like, I just like pumpkins in general. I'm not too sure why I like them so much...maybe it's because it means that it's fall? Or that Halloween is coming? I don't know, but there's just something about them that makes me happy! So needless to say, the last few weeks it's been all about pumpkin! I've made a few dozen pumpkin muffins, a loaf (coming soon!) 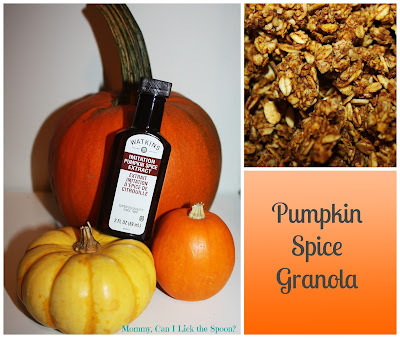 and this amazing Pumpkin Spice Granola! This pumpkin spice granola is perfect in the yogurt, fruit and granola parfaits that I make for Lauren as a snack or a quick breakfast. It's also good by the handful. But unless you have amazing will power, I don't recommend doing that because it's SO good and seriously addicting! *I used one cup of large flaked oats and 2 cups of quick oats because I ran out of the larger oats. I suggest using the larger oats because they tend to "clump" together better. As much as I love pumpkin, I have to say, I'm not a fan of pumpkin spice lattes. But, if you are and you want to try making your own, here's a recipe for you to try. The latte also uses the same Watkins Pumpkin Spice Extract that I used in this granola. I've never tried pumpkin hot chocolate...it does pretty good! This is definitely a good granola recipe!